Knee bracing - what are the indications? Knee bracing – what are the indications? quadriceps and hamstrings. Aside from supporting body weight, the knee also absorbs the impact of walking, running, and other activities of daily living. Over time, the knee absorbs a lot of wear and tear. This may eventually lead to injury, weakening the stability of the joint and causing pain. There are numerous conditions that can affect the knee, including osteoarthritis, meniscal tears, and tears of the cruciate ligaments, among others. Aside from the specific treatment interventions for each condition, knee braces can be used to provide support and stability to the joint. There are four (4) general classes of knee braces: (1) prophylactic braces; (2) functional braces; (3) rehabilitative braces; and (4) unloader braces. Each class has its particular indications, as well as its own advantages and disadvantages. Proper care must be taken to choose the appropriate knee brace. Regardless of the choice, the knee brace must not interfere with the activities of daily living and the functionality of the joint. the Medial Collateral Ligament (MCL) by providing support during rotational stress. Some studies have shown prophylactic braces to be effective in reducing rates of injury, and they are recommended to protect the MCL and other ligaments from injury. This class of knee brace has found its best application in the treatment of sports injuries, particularly during the rehabilitation and post-operative phase. 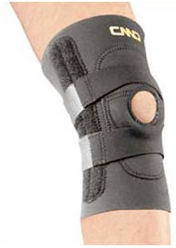 Functional braces are designed to provide support and increase stability of the knee during the recovery period. There are many specific kinds of functional braces, and each will be tailored to the ligaments that need support during the healing phase. A functional knee brace may be prescribed as part of physical therapy. Patients who use functional braces may find them uncomfortable, but they have been shown to improve stability and reduce the risk of injury to the other ligaments and tissues. The relative freedom of movement of functional braces allows them to be used in physical therapy programs. 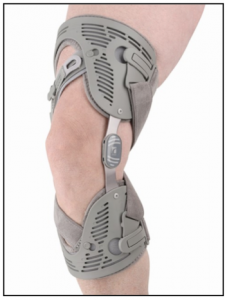 Rehabilitative braces are designed to allow healing of the knee joint. This is accomplished by limiting the movement of the knee to protect injured ligaments and to regulate movement during the rehabilitation phase. replaced by braces that allow greater degrees of movement, such as functional braces. Unloader braces are indicated for people who suffer from osteoarthritis in the medial (inner) knee compartment. These transfer the biomechanical stress from the affected joint onto the thigh bone, forcing the knee to bend away from the affected area, which is often painful to touch. Braces are custom-made per patient, and are built from materials such as metal, foam and plastic.